Buyatab recognized as one of Canada’s fastest growing companies. 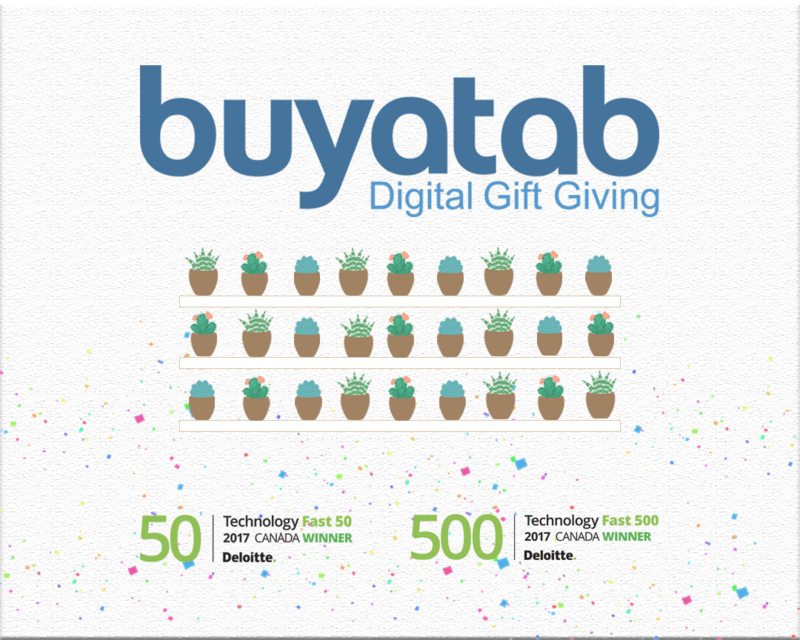 Buyatab Online Inc., a leader in digital gifting, has been named as one of Canada’s fastest growing companies in the Deloitte Technology Fast 50™ awards. The Fast 50 program recognizes 50 Canadian technology companies with the highest revenue-growth rate over the past four years. Buyatab has achieved 627 percent growth in revenue over the past four years. Beyond revenue growth, the list recognizes technology companies that have invested heavily in research and development and own proprietary technology. The Deloitte Technology Fast 50™ program recognizes public and private companies in the technology sector that share common traits and strengths and which are transforming the technology industry. Celebrating its 20th anniversary this year, the program augments the broader Deloitte North American Technology Fast 500™ initiative with winners automatically eligible for this elite ranking.